Chris will tell you, and he thinks I’m ridiculous for it, that I’m THE biggest worrier. I worry about a lot of insignificant, mindless things. And when I’m not worrying, I’m worried that I haven’t got anything to worry about. I’m the type of person that can’t watch a scary movie because they make my heart go all funny and give me palpitations. I’ve learnt though, that worry invariably isn’t actually warranted and that things are never quite as bad as they seem. He’s always saying, “Fear is just the brain, imagining a scenario that hasn’t yet happened” and he’s right. I’m doing much better at remembering this. The small stuff doesn’t bother me nearly as much as it used to. And I’m pretty sure it’s since I’ve had Oscar. As I sit and write this and I think about my Oscar, I come to the conclusion that actually he’s doing brilliantly. I honestly couldn’t be prouder. The here and now is pretty perfect. It’s easy. We take each day as it comes and try not to think too far ahead. But the future frightens me. I know I’ve spent the past few months writing this blog, talking of how times have changed, how people who have DS are achieving so much more now and I know that that’s true, but thinking of Oscar as a 30 year old man, fills me with fear. It’s the unknown. I was told in the beginning to enjoy the baby in my arms and not think too far ahead, but every once in a while, I allow myself to think about him then and I fear for the future of my little boy. Now I know in writing this, I’m going to get responses saying that all mothers fear for their child’s future. That there are no certainties with any child that they’ll grow up and all will be ok. But it saddens me that Oscar is going to have to face things, that others won’t. I canny help thinking that it’s unfair. * Prejudice. Because unfortunately he will have to face it. At the moment I can protect him. I can defend him or remove him from a situation if I feel he is being judged or likely to be hurt in anyway. What happens though if I’m not there? I’ll always remember watching a tv programme about a teenage girl with DS who was on the train with her older sister. They had spent the day together and were travelling home. A bunch of teenagers got on the train and started taunting the girl with DS… To the point of making her cry. She knew she was different and she didn’t want to be. I fear for Oscar and the future and can only hope he’s not presented with this nastiness and cruelty. * School. One of my biggest fears is Oscar going to school. Mainstream or Special Education. There is such a positive emphasis on mainstreaming children with DS which I think is fantastic but what if he can’t cope? What if he’s shoved to one side and given a puzzle because “that’s what Oscar likes to do” and the rest of the class carry on with their studies? What if he’s disruptive because he can’t cope and people misunderstand his behavioural issues with being naughty, when actually he’s just not managing? What if he does brilliantly in mainstream school but as he and his peers get older, the others start noticing his differences and end up feeling he’s more of a hindrance than a friend? What if he gets all the way to secondary school in mainstream and then his friends decide he’s too behind to hang out with them? Will he HAVE friends? Equally, by sending him to a Special School, am I doing him a disservice? Would a Special School help him reach his full potential? Or would they baby him and just let him do arts and crafts when he’s capable of so so much more? Do I want him to JUST have friends with additional needs? Don’t I want him to make typical learning friends so he can thrive? Or is that unrealistic? So many questions that simply can’t be answered yet. Time. Time will tell. * Living alone. Will he ever live independently? Will he be able to cope on his own? Will he be able to read a timetable and catch a bus to the local pub? Would he grasp the concept of money? I know that he could live in accommodation with others like him and there’d be some level of care provided if he needed it but do I trust those care workers with my son? Do they do their job because they love it and want to help people like Oscar? Or are they simply just doing their job because it pays a wage (a low one, by all accounts) and they just need to do any old job to get by? Will they actually care about him, or is it just means to an end? * Vulnerability. My dad’s a retired policemen and I’ve heard him say many times before that bad people pray on the vulnerable. They target people with learning difficulties and take their money. Will Oscar understand the difference between good and bad people, right and wrong? Am I always going to have to be there looking out for him… Or one day, do I let go and hope that he gets it? * Love. Of course I’ll always love him. His family will always love him. But will he find love? That one person to share his life with so that he doesn’t grow old on his own. I know not everyone does but what is life about if you’ve got no one to share it with? I know that what I’m afraid of is the unknown. The what-if’s and what could be’s. The statistics and stereotypes. I believe that worry started the moment that doctor uttered Oscar’s suspected diagnosis of Down Syndrome and the dismal, bleak tone she used. I probably haven’t stopped worrying since. My own silent thoughts. Sadly, there will always be prejudices and by writing this one blog, I can’t change everyone’s misconceptions. But I will protect Oscar for as long as I can, against these outdated views and hope that in time, the world will become a better place. It’s getting there, slowly but surely. As for school, as I said only time will tell. Of all the children I know who have DS and that are in mainstream school, all are coping just fine. I think it has to be the right school, with the right support for Oscar and I will figure out where that will be, later down the line. I heard a fantastic example about inclusion the other day. One of the little boys I teach has just been made Vice Captain of his class at school. He is in mainstream education and has been given the same responsibilities as the next child. They have treated him equally and that, for that little boy, means everything. By allowing him the chance to prove himself and show all that he can do, has given him the opportunity to soar. I’m so proud of him. Oscar will live independently if that’s what he wants to do. I will make sure of it. He may cope just fine, or he may need extra support. Either way I will try to instil a confidence and assuredness that he CAN do it if he wants to. What more can I do? There will always be people who pray on the vulnerable and we will just have to trust that we can teach Oscar to be mindful of anyone who might take advantage of him. Simple as that. And finally, love. “We are all born for love. It is the principal existence, and it’s only end.” I read the other day an article about a couple who met, fell in love and are now planning their wedding. Not really news worthy… But they happened to have Down Syndrome. It’s a shame that the paper felt it was still newsworthy as people with DS now get married all the time and all over the world. We still have a little way to come before we all start realising that this is no big deal. I also read, and this IS a big deal to me, of another couple with DS who were just starting fertility treatment to have a baby together. The world is changing and becoming more open to equal opportunities. In my opinion there is nothing more precious than love and I hope with all my heart, that Oscar finds it. I’ve come to realise in all this, we’ll only ever be required to handle one day at a time. It’d be very easy to lose ourselves in the worry and fear of the future. We could go out of our minds worrying about the years of challenges that are ahead for Oscar, couldn’t we? I have vowed that, when we wake up and are faced with a hurdle, to deal with it there and then, if we can. Not before and not afterwards. The day might be hard and the challenge tough but there will be lots of good things to soften the blow – for both Oscar and all of us as a family. We’ll surround ourselves with people who make us happy, and that love Oscar. We’ll enjoy lovely things that make us all smile. Laughing together, eating chocolate, drinking wine (that’s me, not Oscar obviously), singing, dancing in the kitchen. And hugs, lots of hugs. Oscar always laughs when Chris and I hug… So we’ll hug, ALWAYS. And then when we go to bed and wake up again and deal with the next day, there will also be a whole bunch of amazing other things that’ll happen for us. What’s the point of worrying about the future ahead of us on one given day? It’d be too much. The here and now is all we CAN do. So here’s the thing: the number one reason I was so afraid of Down Syndrome when Oscar was born, was because I had never really been exposed to it. I had never heard the great stories of the blessings and the gratitude. 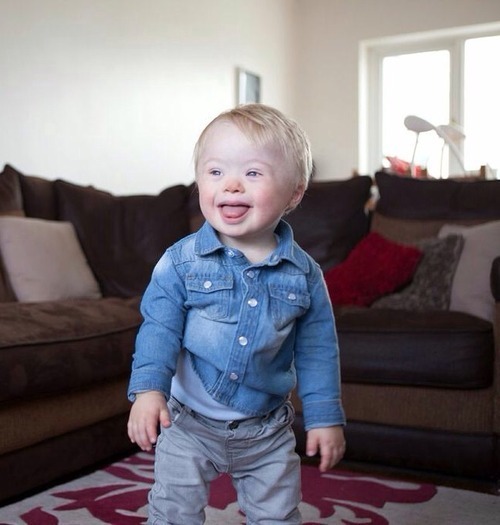 Of just how grateful people were to have a child with Down Syndrome. I had never heard of people with DS getting married or having children. Having proper jobs and living alone. I am ashamed to say I was one of the ignorant- had I known how much joy I’d get from Oscar’s fits of laughter at me dancing in the kitchen, or how my heart could literally burst when I see him trying to chase Chris around the house. The other stuff? Well, it would have still been a worry but frightening? I’m not so sure. 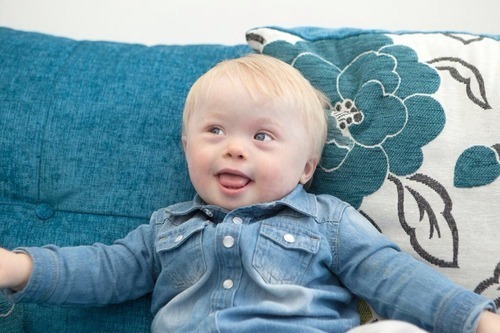 And to conclude this week, I’m not sure if you saw it but a video message entitled “Dear Future Mom” was created to coincide with World Down Syndrome Day last month. A worried mum-to-be who discovered her future child had Down’s Syndrome, talked of her fears. The clip had more than 2.5 million views on YouTube. In the video, a woman writes a letter explaining she is scared about what kind of life a child with DS can have. Young adults in the clip, who have Down’s syndrome, then respond to her fears and say that her child could expect to have a fulfilling and normal life, just like everyone else. To say that I cried when I watched the YouTube clip would be an understatement. I balled my eyes out. Not because I was sad. No. Because they had captured it so very perfectly. It was beautiful. I was that mother then but thank goodness, aside from the odd wobble, I’m happy in the knowledge that the future looks to be actually pretty wonderful. What kind of life will my child have? He’ll be able to hug you. He’ll be able to speak and tell you he loves you. He’ll be able to go to school like everyone else. He’ll be able to learn to write. And he’ll be able to write to you if someday he is far away. Because indeed he’ll be able to travel too. He’ll be able to help his father fix his bicycle. He’ll be able to work and earn his money. And with that money he’ll be able to invite you out for dinner. Or rent an apartment and live alone. Sometimes it will be difficult. Your child will be happy just like I am. And you’ll be happy too. Honestly, I know exactly how you are feeling. My 10yo autistic son (who also has an intellectual disability) is currently going to mainstream school with a modified curriculum. Now that he is in year 5 at primary school, we have to start thinking about where he needs to go to for high school. I worry all the time about how much he will actually learn, how he will get along with other kids (especially high school), will he be able to get a job, find love, live independently etc. I think all us mums with kids with special needs go through this. If only someone could write an answer book for us, we could actually get some sleep at night. I guess all we can do is the best we can, as much or as little therapy as we can and give them life skills at home.